One of the things that I like about blogging is the feedback and ideas I get back through comments. At the very least they often get me thinking and sometimes rethinking. Whether that extra thinking confirms or changes my mind, or just awakens a dormant thought or intent, I'm better off for it. I did some ciphering and imagining yesterday about the footprint of various sizes of 54mm units, about scenarios and force make up, about existing figures and possible future units and about force and command structures in various mid-ninteenth century historical engagements of a comparable size to various scenarios that I might play . I didn't come to any conclusions other than that I need to cast and paint at least three dozen figures before any of it is relevent. However, just thinking about rules for command reminded me of a thought/feeling that I had at Fall In which was that while I enjoy the sort of short quick "game" Wargames that I have mostly been playing recently, I miss my old style of longer, still simple but slightly more complex and less "gamey", wargames. The resolution I took then was to make an effort to keep doing both when I got home. 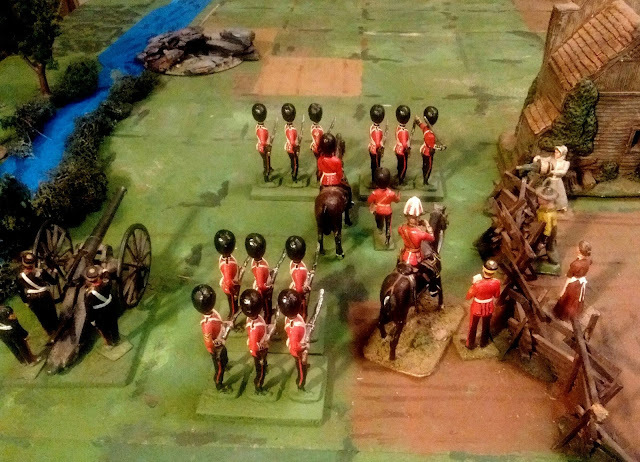 So, while my 54mm armies are being rebuilt, I have a generic 16th Century English army vs an Auld Alliance Franco-Scots army Gathering of Hosts game set up on the table while I tinker with version 8 of the rules which will hearken back to Rough Wooing. What to do with unemployed Colonels? 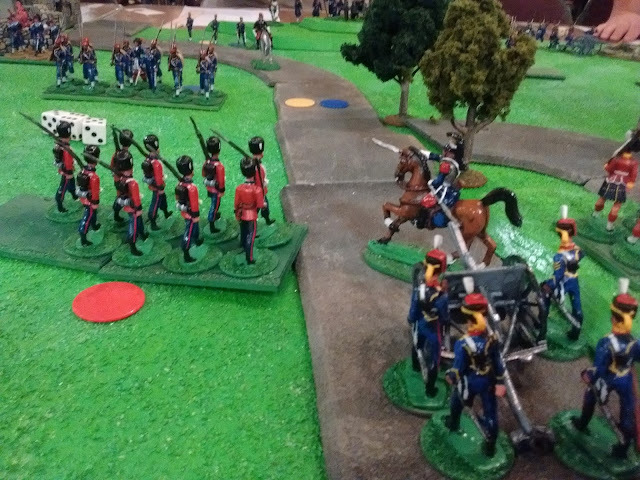 If I was less fond of my mounted toy soldier officers, toy soldier game design would be much easier and I could just go with one General per side for these small games. For some time now I have been quite aware that too many commanders spoil the wargame command broth either by making it too easy to get everyone going or by adding too much overhead in the way of either artificial rules to hinder them from doing their job or excessive details and processes. If the player is the General then someone else (ie the game mechanics) should be doing those lower level jobs, and doing them competently most of the time, unless they are part of an army which is both untrained and inexperienced. But if I only need one General, maybe with some aides for the look of things, what do I do with all these other mounted officers? Recently my mind has started going back to all those magazine pictures of Peter Gilder inspired battalions with a mounted officer in the middle. Hard to do with four man units, hence my prolonged efforts to include rules for Colonels and Brigadiers. Even my proposed twelve figure units don't have room for a mounted officer but it occured to me yesterday that for the 1860's Anglo-American border war, a three stand 54mm battalion could accomodate a mounted officer, flag, musician, foot officer and sergeant along with twelve other ranks and look acceptable. Mock up of two of the new battalions. Unless I expand my table significantly the maximum number of figures per game has to stay roughly the same. This brings me back to needing a set of rules designed for a small number of long lasting units, in other words, the sort of games suggested by One Hour Wargames, just not those rules since they are not to my taste. This means fewer regimental uniforms will be represented but at least my Colonels will have a home that doesn't adversely affect the game. Right now there are two approaches that seem attractive. One is to ditch the grid and look at various past versions of Hearts of Tin with three stand battalions. The other is to drop down to a 3" grid with each stand being a unit and allow a Colonel to control 2 adjacent units then proceed with a version of the Square Brigadier. Both sets would probably go back to rolling an "Orders" die each turn, a system that has worked well in the past with a small number of units. Since the basing and organization will be the same either way, I will proceed to paint and base figures and delay a decision on rules until I have enough battalions painted and based. 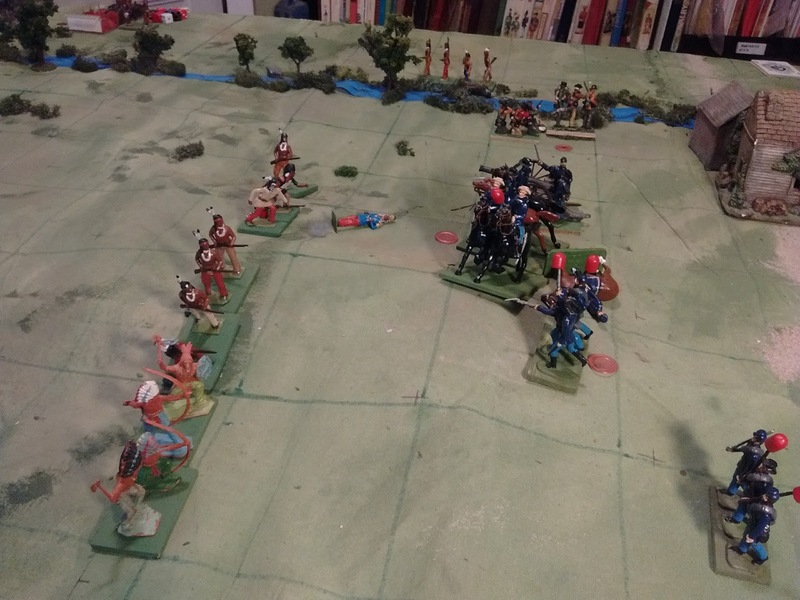 The NorthWest campaign against the Indians and metis will continue to use one rank half- stands since all units are skirmishers. Initially some existing units will see double duty but, since the numbers are so low, I hope to eventually have all the Canadians wearing more appropriate uniforms. During the final decade of the 20th Century a couple of us got into 54mm WWII. We started with Rapid Fire! then experimented a bit but drifted off to other things early this century. After our last game of Airfix Battles, Ron decided that it wasn't quite what he was looking for so he picked up Bolt Action and yesterday we gave them a whirl. I'm not sure why I was expecting him to stay with his 20mm figures. Once again 1/32 Airfix Ghurkas and Afrika Korps clash! Somewhere in that oasis is a vital well. As usual, we like to do things our way and adapt rules to our purposes rather than mindlessly obeying so I shouldn't have been surprised when Ron hauled out the 54's and we started discussing adapting BA to the hex grid. For the curious, a basic squad of 5x54's will fit nicely in a 10cm Hexon hex so we just declared each grid equal to 3" for ranges and moving etc, rounded odd numbers when they appeared and declared that the 1" rule applied to adjacent hexes. Seemed to work well. The highpoint of the battle. Several of Ron's units are pinned in the open and the infantry I had rushed into the oasis have located and seized the well. The basic rules were pretty straight forward and made sense. There were some odd omissions and odd inclusions on the quick reference sheets which resulted in a lot of time spent checking and rechecking for basics like morale check details but by the time a couple of turns had been played it was flowing well. As darkness fell (ie I realized that I was already an hour late) Ron offered me a draw since I still held the well, (technically). Since I only had 1 lone infantry squad left, my heavy weapons, which were all pinned down, were covering the approaches that his three remaing units of superior infantry no longer needed to use, and he had an infantry unit adjacent to and arguably contesting for control of the objective, I declined the generous offer and ceded the game. One game is almost never enough to judge a set of rules by but we had fun and overall they seemed to work without too many oddities. Basic fire and move tactics, fire zones etc seemed to work and so on. There were a few Warhammerish oddities such as the deadly Ninja-like rules for the Ghurkas which we only discovered when Ron charged one of my units to see what would happen and we cracked the close asssault rules. Things like that can be dealt with easily enough by house rules though. I didn't exactly expect my revived Toy Soldier enthusiasm to lead me here but its a happy place. Today I gave Scenario 12, "Unfortunate Oversight", from Thomas' One Hour Wargames, its third outing in a week. The first game was last Saturday's non-gridded British vs US game using variable moves and counting noses. 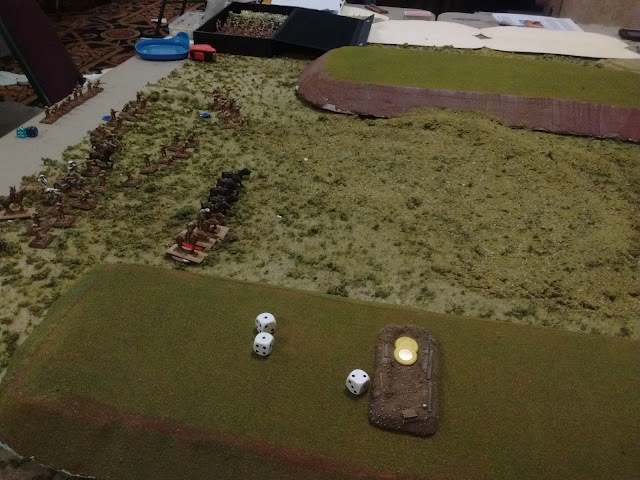 The second was an on-grid US vs Indians game using an experimental set of rules which gave an OKish but not very exciting game. 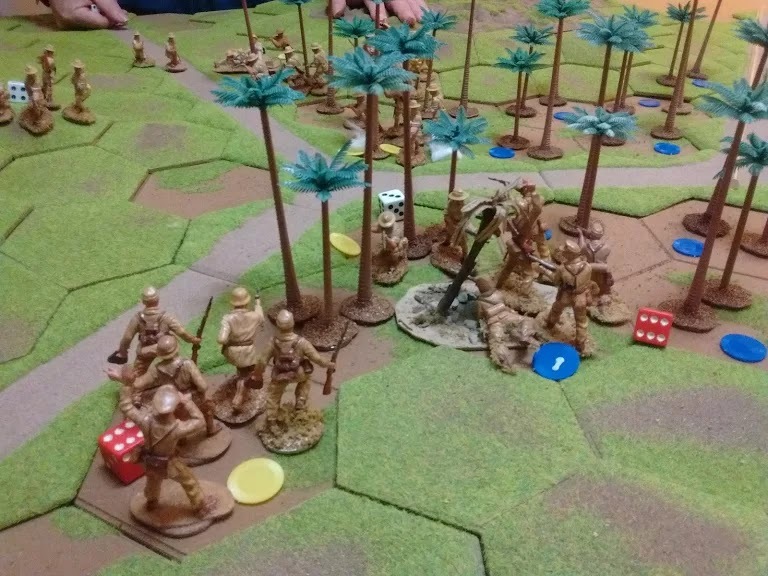 Today's game was a return to the Square Brigadier (Tin Army) with some tweaks to the rules and unit sizes. The scenario is an attack by one force on an equal sized force of defenders. 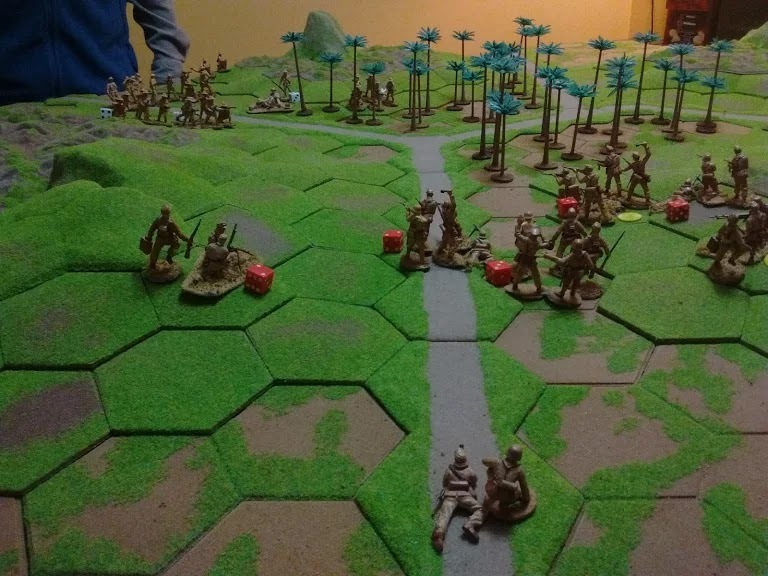 The trick is that the objective is a hill in the middle of the board but the armies are separated by an unfordable river and the defender thinks that the only crossing is a bridge by a town so he must deploy all units within a foot (3 squares here) of the town. The attacker, however, knows of a secret ford off to the flank. The setup. The Americans have 3 infantry, 1 militia. 1 gun, 1 cavalry. The Indians have 6 Indian units. Amongst all the various small issues there have been two main ones. 1. Command Control. I want a role a C&C role for commanders, one that adds some friction but which is neither too random nor too onerous/distracting or artificial in terms of mechanisms. There are lots of approaches which work well but one of the simplest and most adaptable is to mix chance cards with a die roll for detached/isolated units to provide for the oddities, delayed orders, court martial-August I started experimenting with an initial "command control" phase in which I seek out and mark isolated or detached units which need to test before acting. The markers make it harder to forget and just move the units without rolling. Today I realized that I could actually combine these units with those recovering from adverse combat results and by giving a range of results on 1 die roll could make everything work smoother. With the units being slightly larger this allowed the one common roll to effectively replace the Rally and Command rules by a combined one while giving players less choice on how their units act under fire, thus increasing the benefit of reserves and supports. The defender reacts and occupys the hill. I'm not sure why the American allowed himself to devote so many assets to the small decoy force across the river. It came close to costing him the battle. 2. Firefights. A common theme in 19th Century battles is that long and medium range firefights between opposing skirmishers or lines of prone infantrymen tended to be long and indecisive. For the men on the line a slow trickle of casualties was disconcerting but ammunition shortages and exhaustion were usually a bigger threat. One could just assume its happening but especially in smaller actions like the battles in the Riel Rebellion, and the Boer War they were important to the men there and often did eventually influence the final result. For the last two years I've been trying different approaches from a simple fire or move to various "pinned" results or options, reaction tests and so on. The result was generally either a boring game or units that died too quickly or never at all. I am now using units that are slightly stronger without an increase in firepower and an involuntary pinned/go to ground result using the same marker as put on isolated ones and triggering the same test. There is also a a chance of actual casualties and a chance to be forced back by the fire of several units. Several units were weakened and forced back by overwhelming fire and some heavily damaged units struggled to rally but the only units destroyed outright were destroyed in close combat. Together it all felt just right during the game. As the turn deck sank slowly in the west, a prolonged firefight had worn down several US units and a rush led by Chief Yellow Feather drove the Americans off the crest of the hill despite the intervention of Colonel Lannigan. By a typical fluke of the dice both leaders were wounded in the fierce fighting. Alas for the Indians I forgot that a replacement should have been able to take over after a short while. Leaderless, both sides rather ground to a halt. The Indians had been doing much more damage than they were taking and a few more hits might have broken the American force but for the last 3 or 4 turns even the broad side of the barn was safe and the game ended in a draw with the hill still in dispute. One small game is not much to go on but after five...six? (I should look that up) years it feels like what I was aiming for all along and not quite reaching. More testing is of course needed. A test of the battalion rules though may have to wait for another two dozen Bluecoats and Zouaves to be painted up. For those wanting to look at a copy of the revised rules, well, its just a few scratches on a slip of paper right now backed up by habit but I'm working on an updated edition on the rules and they will be available here as soon as they are done. The physical work of upgrading the North West campaign "armies" has begun but that is the lesser part really. I confess that lately I have had to withstand an internal barrage of nostalgia for simple, fast moving, single figure games but much of that is really nostalgia for games that I didn't really play or games that I played but don't really want to play again on a regular basis, especially as solo games. So, work has begun to find a compromise between that nostalgia and the sorts of games that I have been playing over the last five years. A compromise that will give me just the right sort of game for these 54mm armies. Player focus on the battle plan rather on micromanaging the details of unit tactics, formations etc. The assumpion is that unit officers and ncos are usually competent to do their job. Really lousy combat results in a favourable situation may indicate a failure of unit command along with other possibilities that we will never know. The basic premise from Hearts of Tin and the Square Brigadier will be maintained thus there will be a clear division between long ranged combat which slowly wears units down and much more decisive close combat, whether close range shooting or the threat or use of cold steel, which can quickly result in the destruction or retreat of one side. Other things such grid or no grid remain to be resolved. The full battle armies won't be ready till midwinter at the earliest but I'm nearly ready to give the upgraded 6 figure skirmisher units and some rules a spin this weekend. I had better things to do today than muster 54's, well OK, not better really just not hobby related. However, the fatigue and burn out from my long drive is just catching up with me and peaking, so here are my short and long term 54mm toy soldier goals and an assessment of where I'm at. Red's Commander musters his division for inspection, ready or not. For the Canadians I have enough infantry although I eventually want to replace at least some of them with figures in campaign dress. I have 1 unit of sharpshooters and some figures to refurbish as a second unit. The cavalry will consist of a unit of lancers in stetson and I have figures to convert to NW Mounted Rifles in pillbox caps. The artillery just needs the machine gun made. The Americans need their infantry units expanded from 4 to 6, the cavalry upped by 1 figure each, the machine gun added, and a few sharpshooters touched up a bit to look more Buffalo hunter/scout like. Hopefully all of that will be done by the end of the year including basing all three armies. My initial forces for the Eastern campaign will have six, twelve figure, infantry units each plus two each of other units. The British can fudge that as seen above but some units could use refreshing and I intend to replace the copies of the Herald Highlanders with some line infantry and I will probably reduce the Naval Brigade to one company plus a gunboat crew. That can wait until I bring the American infantry units from 6 figures to twelve, add 3 more including Zouaves, and add cavalry as mentioned above. I also need 2 guns, not too big or too expensive. With luck I'd like to see at least a small game by New Years. Perhaps one of the scenarios from Thomas's Wargaming tbe Ninteenth Century book which I picked up on kindle just before my trip. Coincidence? Good thing this little exercise was really about trying to feel out which way to go with my collection of 54's. The rules were, well, ok but just. At the very least they need some tweaking to extend the life expectancy of units, add flavour and give players more to think about. However, rules aside, the game did what I wanted and helped me decide where this should go. Turn Three. The Black Horse begin a charge on the gun but are handily repulsed with little damage on either side. a) Since I already have more figures than I can squeeze into my NorthWest campaign in its current format and since there are a limited number of scenarios that fit within the setting and premise, can I reasonably make it bigger or could I do some thing else that would compliment it using mostly what I already have in the way of figures and moulds? b ) I am already tired of chasing single 54's around on uneven terrain so did I want to stick with flat terrain, single figures and small forces or give in to the urge to mount them on bases again and use the cloth over the hills terrain? If so should I go with Morschauser's proposed 4 infantry in 2 ranks on a base like I am tempted or go with larger units which is an attractive thought and what should units look like for the two different campaigns? In any case the bases would have to allow units to occupy my new standard houses or in other words fit within a 60x60mm foot print. c) Since using more figures per unit would allow me to use more of my collection to play exactly the same games using the gridded Tin Army is that a good option or is there a better way to have the North West game feel like small forces skirmishing on the wide Prairie and have a different game that feels more like a battle between armies and possibly be able to get double use out of figures by having basing and organization be compatible? First blood for the NorthWest Lancers! 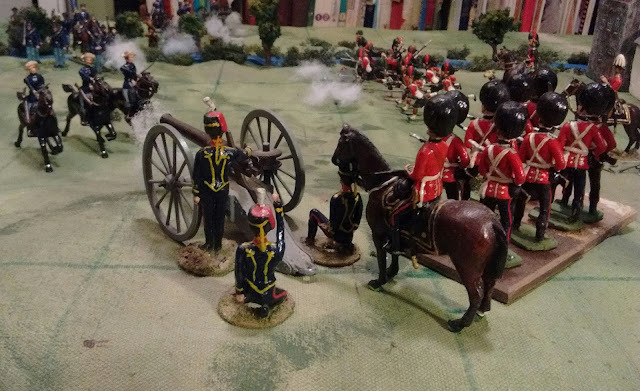 As I have mentioned previously, I originally started casting 54's for an 1860's British vs US game whether intervention in the Civil War, enhanced Fenian raids or just Toy Soldier Silliness. After looking at what I have on hand, it just makes sense to gracefully pick up where I left off fifteen years ago, but with 12 figure battalions instead of 24 given my 1/2 size table. This will use basically all of what I have on hand or have moulds for with room for only a few purchases such as artillery pieces needed and will allow virtually any scenario I want to tackle. My 40's will have to content themselves with the War of 1812 and the Great Atlantican War of 1902. My 20mm ACW armies will again be nudged towards Brigades as units and bigger battles. Less than 1/2 way into the game the US sort of ran out of units and I called it off. I have a great fondness for Morschauser style 4 figure bases, especially if each is a unit, but there are issues. For the Prairies they just don't look like the iconic long lines of skirmishers one sees in the prints. That look is vital so the Prairie portion must have a single rank option. Back in August I decided that I liked 6 figure units with 3 figures in a single rank on a 60mmx30mm base. They didn't fit well with the Square Brigadier or 4 inch grid squares so I dropped them but they are just too useful and it will be easier to adjust the rules or the grid. The 3 figure bases are coming back then whether on a 5" grid or without a grid. Armies in the east will have 12 man battalions in 2 ranks with up to a dozen or more units on table, while those in the west will have to content themselves with 1/2 dozen 6 figure companies in a single rank. My first plan, back in August. Rules? We'll have to wait and see! So I decided to try a OHW scenario using the 5" grid with 8 figure infantry units... no wait.....make that grid-less with 8 figure units and MacDuff... sorry, no ...... how about...ahhh yes, grid-less using Tin Army-ish 4 figure company units (imagine Morschauser style stands) and vaguely MacDuff like movement...... Yeah, That's what I wanted to try. **OK turns out the second option was the one I really wanted after all. The gridless Tin Army never got off the ground. Units are 8 infantry, 4 cavalry or 1 gun and 3 crew. Sequence: Make a deck with 1 card per turn. Draw cards for initiative, chance and to track turns as per Tin Army. Active army activates 1 unit or group at a time and moves and/or shoots or rallies then melees if in contact. Infantry 2 dice +1 in column. Lose high die to change formation, limber, mount etc. Turns are free. Lose high die to cross passable obstacle or terrain. Cavalry and arty can't go in woods, swamp etc. Add 1 die if following road. Lose 1 die to move and shoot. May not shoot and charge. Colonel may join and reroll 1 die. Shooting 1 die per 1 gunner or 2 rifles. 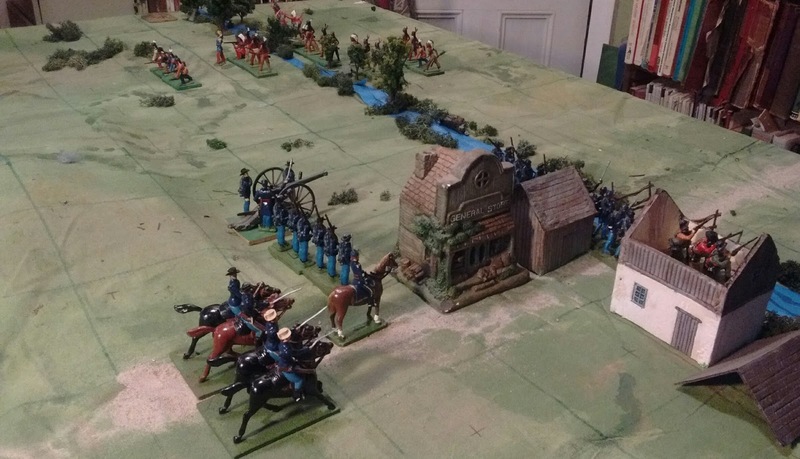 Troops in cover, cavalry and artillery suffer 1/2 casualties. Carry remainders. Melee. 1 die per 1 cavalryman, 2 infantry or 1 gunner. 5,6 hits, +1 if elite or shock trooos. Troops in cover or behind obstacle suffer 1/2 hits. Side suffering more hits retreats in disorder. If tie cavalry retreats 2d6 facing enemy, may dismount. Leader may roll 1 die: 4,5,6= 1 hit cancelled or extra hit on enemy, 2,3 no effect, 1=dead. Morale. A unit which is below 1/2 strength must test the first time each turn that it takes hits including the hit that dropped it below 1/2. 4,5,6 carry on, 1,2,3 fall back a full move in disorder, 0 rout. +1 elite, -1 militia/irregular. Commander may reroll once. An army which has lost over 1/2 of its units is defeated. 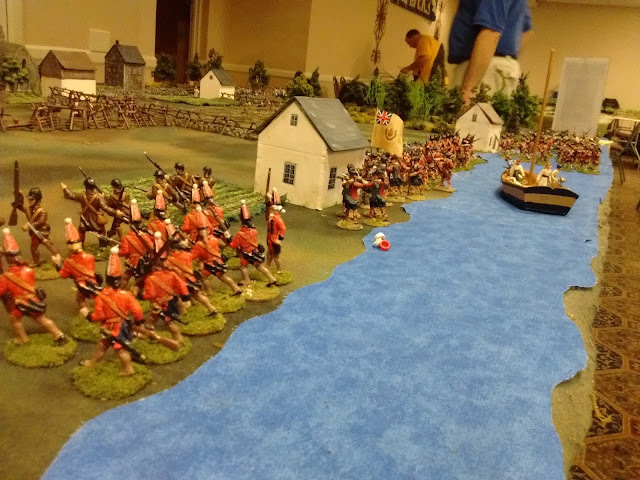 Turn 1, The Canadians react to an outflanking move. In the grand scheme of things this is a small matter. Half of my favourite glossy toy soldiers are old 54mm ones while the rest are only 40mm tall, all of the same era. This my friends raises the insane spectre of evil Dr. Duplication! Zinnbrigade 40's face Britain's Standard. My plan pre Fall in was to deploy a small number of 54's in a gridded 1870's game with company sized units while the 40's could have the turn of the century with a similar style but more units. Its still a good plan in many ways and I'm going to stick to some version of it. Being still under the influence of Howard's shiny 40mm game I just might give up the really small units on a grid approach for the little guys and go back to 12 or 16 man "battalions" off grid. My big sister Glenna painted this portrait of our Dad. My father was one of the least soldier-like men that I've met but none the less he signed up early with the Royal Canadian Signal Corps and headed overseas. 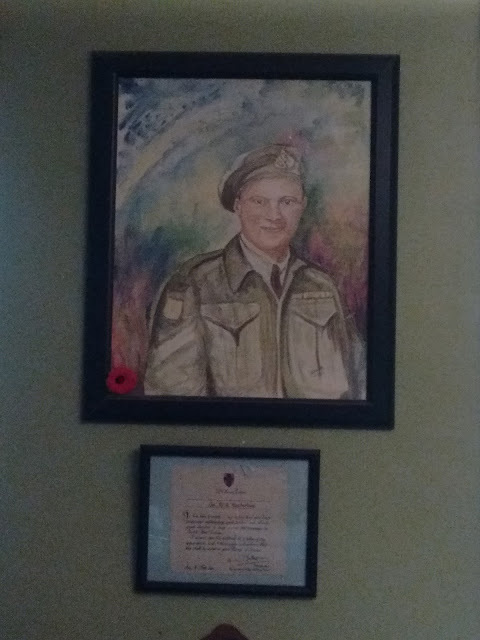 He served with the 5th Canadian Armoured Division in Italy and Holland as a front line linesman, laying and repairing telephone lines under fire amongst other things. He didn't like to talk about how he earned the citation so I won't share the whole story here but he did share it with me once after I was in uniform myself. It wasn't some instance of dramatic heroism though, more a matter of steadfast, determined duty in difficult, dangerous circumstances when a counter attack broke through and divisional HQ was temporarily over run in Holland, far behind where he and his assistant were doing their job. 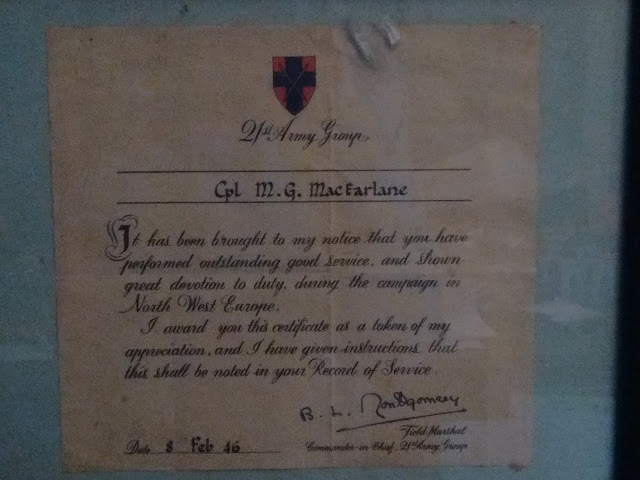 A closer look at his commendation sign by Montgomery. Its a pity that the title "There and Back Again" has already been taken but yes I am once again "Home from the War(games)". I'll skip over the travelogue except to say that it was a lonnnng drive with enjoyable stopovers with friends and an even longer drive home without the visiting. The convention itself was excellent, most enjoyable and almost worth the travel. For those who are hoping for detailed accounts of games seen or played and awesome pictures, SORRY. Just more poorly lit cell phone snaps and few brief accounts low on details plus a few very brief observations filtered through the various games and long hours of driving. (For the curious, about 24 hours road time each way spread over 3 uneven days and that feels about like what it sounds like if you are also a person who is not fond of driving and Hates the periods of heavy traffic ). OK lets skip to Day 1. Fall In 2016 Day 1. My Highlanders land on the north shore south of Quebec. These figures are my conversions of various Meisterzinn castings which were moulded and cast for us by John McEwan of Reviresco, somewhere around 2000. Friday started with a walk about and visit to the dealer hall where I snagged a clearance sale on about a dozen 40mm 17thC Drabant Russian and Polish infantry. No, I won't be building an army around them, just adding them in as more Hungarian or other European levies in my 16thC Ottoman army-to-be which uses a Morschauser inspired unit organization of 4 infantry or 2 cavalry to a base. Imagination coupled with wilful ignorance allows such travesties and they are such beautiful castings, too beautiful to be passed up. Later at the flea market an attempt to buy a used Osprey on Pavia from a friend turned into a gifting of said book which is pretty darned good no matter how you look at it. By 2pm it was time for my first game as player. 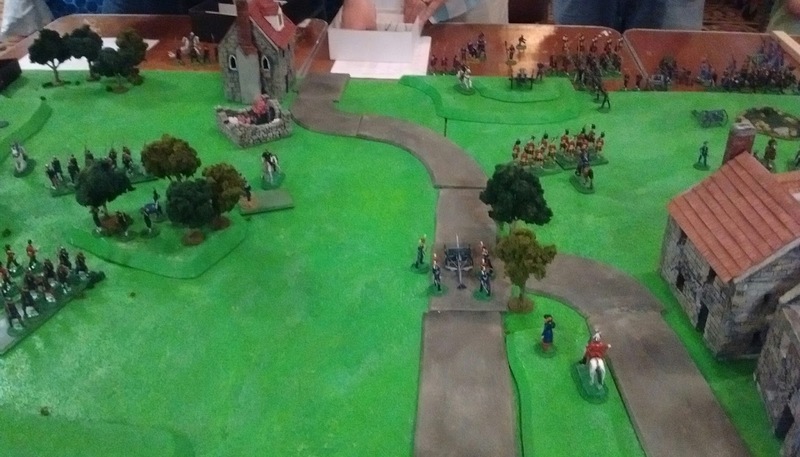 This was my preregistered game, a 40mm Toy Soldier game run by Howard Whitehouse using a simple but effective, fun set of rules which he is developing. I was one of three British players in a fairly straight forward encounter with our aim being to prevent the foreigners from being able to march farther up the road. Since neither of my teammates wanted to take the prime command I took it and we agreed to a general plan and fairly equitable distribution of force. I figured the centre was no place for cavalry in the 1880's so placed 2 light regiments on the left hoping they could exploit an open area while detailing some heavies to the right. The guns, infantry and guns were spread across the front. Rather than having fixed turns the game runs in a continuous loop with actions triggered by the turn of a card with Jokers triggering chance effects and end of turn things including shuffling. To keep the game going each pair of players had a deck with the occasional cross-deck interactions being handled as they came up. This kept the game running smoothly and the players constantly acting with little or no respite for players to take a breather and look around so I had but vague impressions of what was happening on either flank except when the boundaries between sectors wavered. 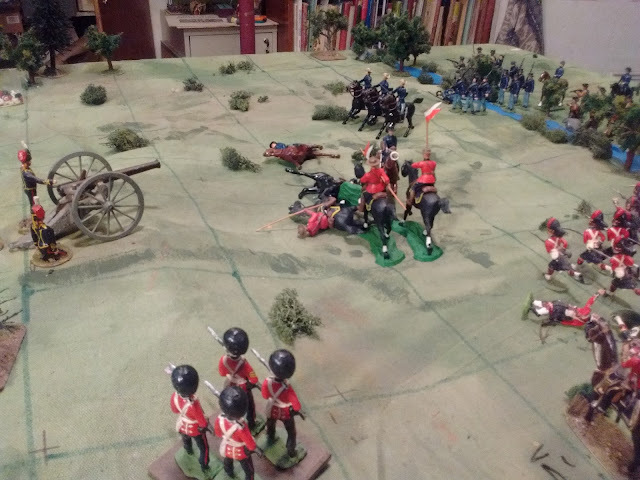 I did notice the gallant but futile charge of our light cavalry very few of whom ran away and eventually noticed that near the end of the game, the British troops on my left had been replaced by French ones. Luckily by then I had pretty much cleared my front and was able to shift forces. I also noticed when there were no enemy between my riflemen and the gun shelling our right wing and took that one out before taking out the gun shelling me. Still, all in all, I was relieved when the rest of the French army decided to retire against the General's wishes. Wonderful toy soldiers, great game master and fellow players, fun game, everything a convention game should be. The end. In my imagination a few stragglers from the Fusiliers are still guarding the flank of my gun until the Highlanders and some Engineers arrive. Once Howard's game was done I had to hotfoot back to the HAWK's room to help Rob set up our game. This was based loosely on an historical event during the siege of Quebec in 1759. In an effort to draw Montcalm out Wolfe sent raiding parties up and down the river, burning farms and destroying or disrupting the flow of supplies bound for Quebec. In this particular case they had information about a warehouse and one raid had already been repulsed. 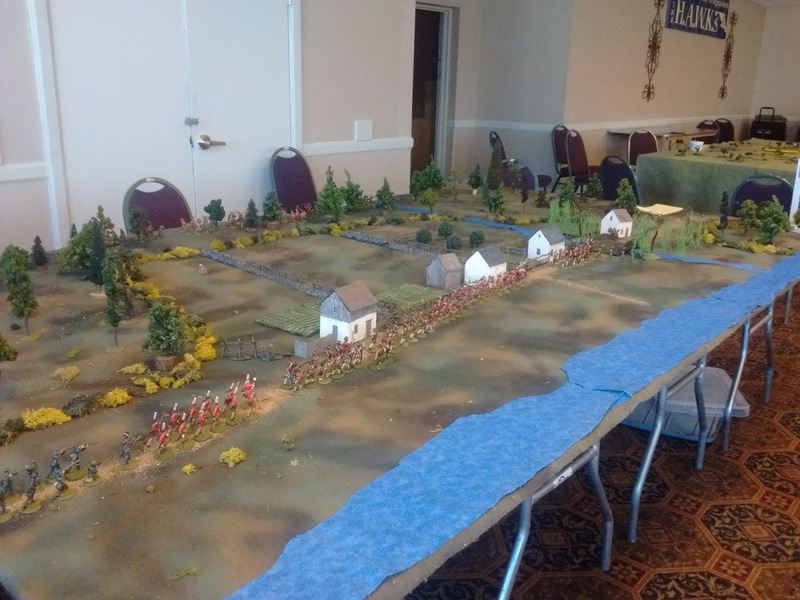 The French began with a handful of militia on hand with reinforcements of picked units, Indians and regulars arriving on table. We ran the game previously in 2005 but that seemed like a long time ago now and my partial tests had taken place as solo games on a table less than 1/2 the size of this one. It had also been 2 1/2 years since the last time I had GM'd this sort of multi-player game so I was feeling just a little bit rusty and apprehensive as the start time approached. Its always a bit tense waiting to see if you have a quorum but between preregisters and walk ups we filled all eight spots. Pregame. Picked units of militia and a company of Colony Troops arrive. Three units of Rob's Irregular Miniatures. This may sound odd but I was so busy with managing the flow and resolving rules questions that I have only a vague idea of how the game went other than that, as usual, the advantage seemed to ebb and flow from side to side. When we finally ran out of time the British were occupying the target but were too hard pressed by the defenders to have managed to identify and destroy the stores cache. Losses were heavy on both sides but I called it a winning draw for the British since they held the objective and were not so hard pressed that they couldn't have fired the building before withdrawing. It was certainly a relief that the players seem to have enjoyed the game on the whole. The bulk of the troops were conversions of homecast Prince August or Meisterzinn figures. About 1/3rd were done by Chris Palmer with the rest being Rob's. Only the Highlanders and boat's crew were mine. 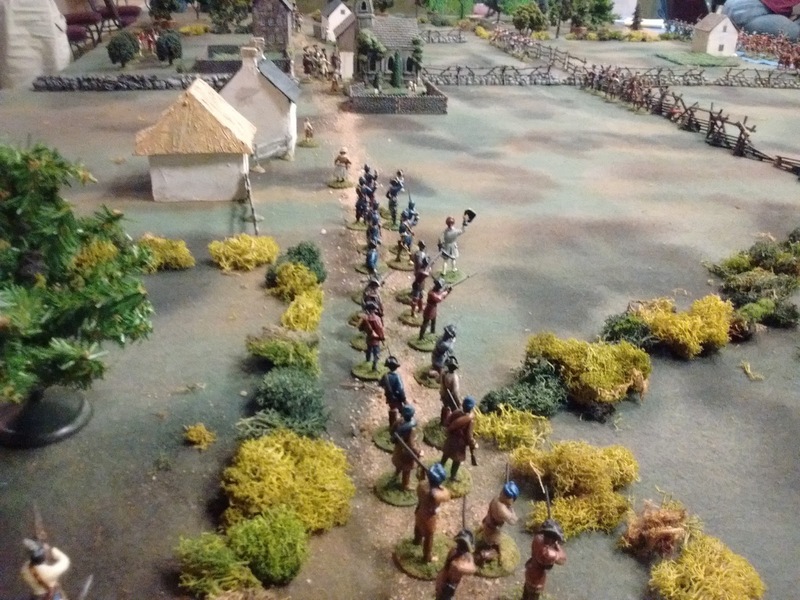 Here Gage's Light Infantry are Rob's work while the Royal Americans were done by Chris. The next game came Saturday morning. This was based on the Battle of Bloody Creek during Pontiac's Rebellion. The previous day's toy soldier game had gotten me thinking about play sequencing and while I didn't want to go that far I decided to unilaterally change the sequence slightly between games. In Friday's games each player on a side activated one unit each time a card was drawn. That was actually a new idea I hadn't tried before the game. I had also introduced a new "final fire phase" which allowed units that had held fire to fire at the end of the turn if their fire had not been triggered by enemy actions. That was contrary to the original rule and muddled the play sequence a little. In addition, the original rally when activated rule which allowed player's to slowly accumulate hits before rallying had been replaced by a rule requiring rallying at the end of every turn to avoid having to drag 'hits' around from turn to turn. Melee's had always been fought at the end of turn which was contrary to every other combat. What I decided was to activate 1 player or "command" per card and have those active units conclude their action, any enemy reaction, melee and rallying right away. To my mind this not only fit my idea of how the game was meant to work but was smoother and felt more natural as the game played out so this will be the new standard. 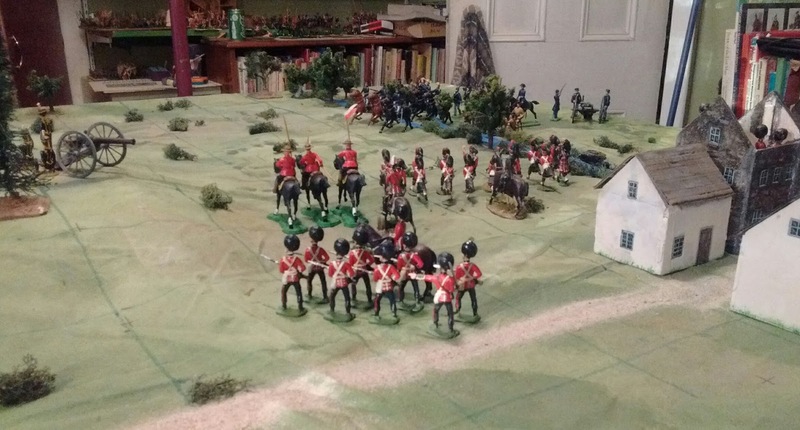 Roger's Rangers and a company of Grenadiers form the advance guard. Rangers by Chris, Grenadiers by Rob. The British mission was to make a night march across the board to Pontiac's camp and attack it. The historical action developed around two key things: the Indians got word of the attack and the camp had actually been abandoned months ago. The game began with reduced visibility which increased as the day went on. possibly more quickly than it should. Once the British Advance Guard had fought their way through to the clearing they were informed that there was no camp and that their new mission was to get as many men as possible back to the fort. The Indians had been told that their sole mission was to kill as many British as possible, that they would receive reinforcements through out the game and that their own "casualties" did not matter (most casualties being assumed to be warriors who had slipped away rather than actual dead or seriously wounded). What I didn't explain, on purpose, was that their losses were the main source of reinforcements, I wanted to encourage bold attacks but not not suicidal ones. Despite repeating the victory conditions several times, I don't think I ever made it clear enough to the players as most of them were quite cautious through out the game in typical Indian fashion, unlike Pontiac's men on the day who seemed to have displayed unusually aggressive and persistent tactics on the day. This wasn't a problem when we first brought the scenario out about a decade ago but if we ever bring it out for a third time, I will have to prepare a better briefing. The set up prior to the hidden Indian units being placed. As it was, the British were still hard pressed but not as hard pressed as on the day. The players handled the mid game change of orders well with only minimal delay for it to sink in and have them react effectively. One of my favourite moments came here as the remnants of the Advance Guard came stampeding back past the main column with a brief order from the senior commander to "cover me". Almost instantly a chance card was pulled resulting in a bayonet charge by said new rearguard. Perfect, though random, timing. 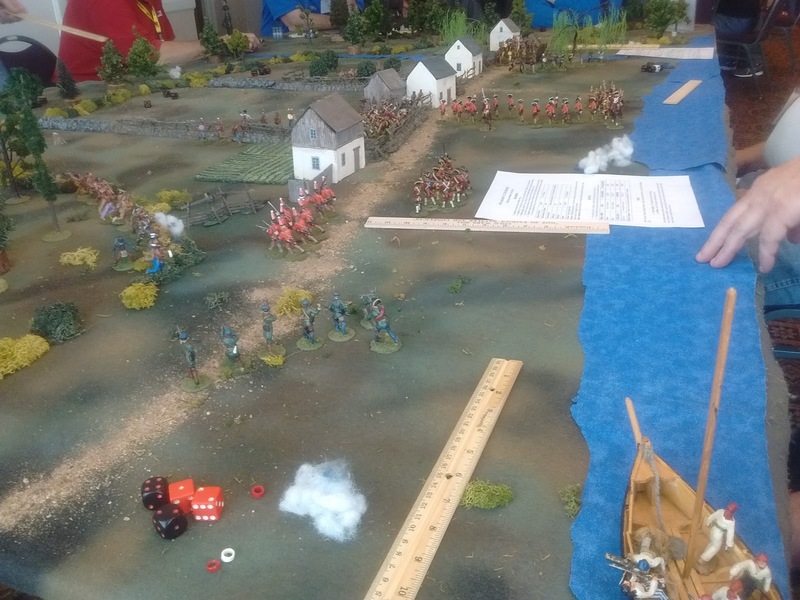 We didn't quite play to the end of the gaming session as it seemed pretty clear that the British were going to be able to escape with the bulk of their units intact. If I'm not mistaken, the rangers of the advance guard were the only unit routed. 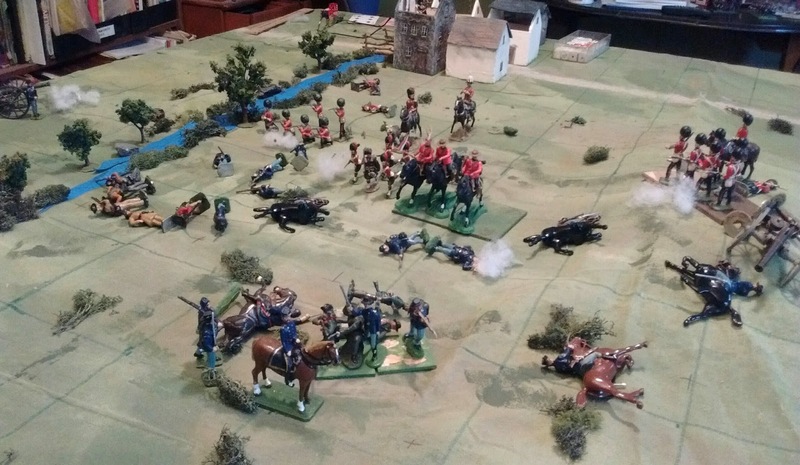 All in all, despite some occasionally heavy casualties, the British did much better than they did on the day. To my mind this was largely due to not having been pressed closely and kept under close range fire as they were in the actual engagement however, it may also be because the British were too crowded without enough gaps for the Indians to infiltrate through. 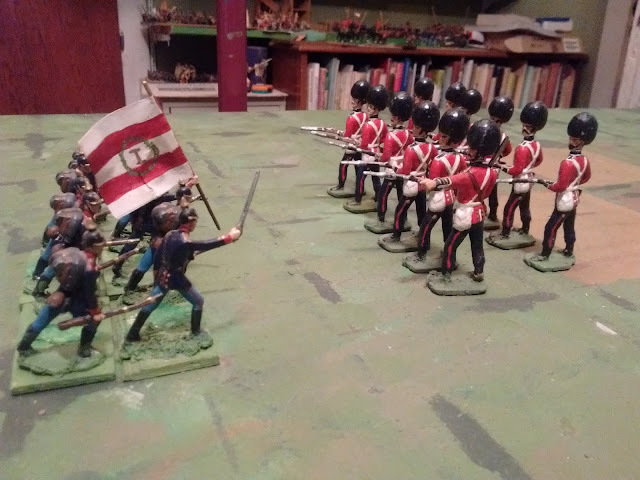 Using eight figure units instead of 12 for the British line units might have been a better idea. This would have made each unit more vulnerable to losses as well as making it easier for the Indians to find gaps. Extending the hours of darkness would also have helped encourage close in fighting. Something to keep in mind should we ever run the scenario again. The end of the game. Rogers himself and his oft rallied Rangers were still holding the road open as they did on the day. (These are Rob's rangers and this unit are Irregulars). The gunboat has arrived to provide cover fire. I was hoping to get away mid morning on Sunday after a round of goodbyes and a last sweep of the dealer hall and flea market so all that remained of Fall In for me was to find a game to play Saturday night. There were some interesting ones to consider but in several cases beautiful looking games in periods of interest used rules I knew I didn't like. Luckily there was a spot open in Roy Jones' Sword & The Flame game set in German South East Africa. Tick! Tick! It turned out to be a good choice and a very enjoyable game despite our utter failure to secure victory over the Herero freedom fighters. 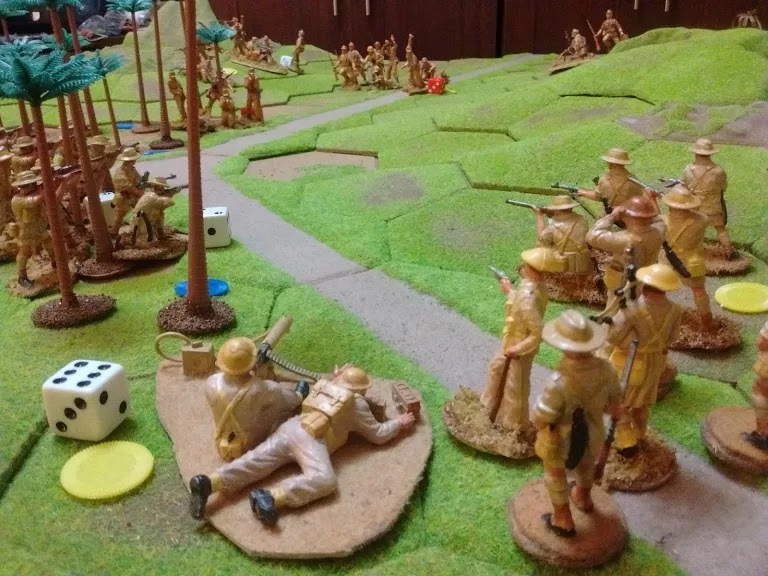 25mm The Sword and The Flame German South West Africa game. A good relaxing way to end a convention. So now its back to "what next?" 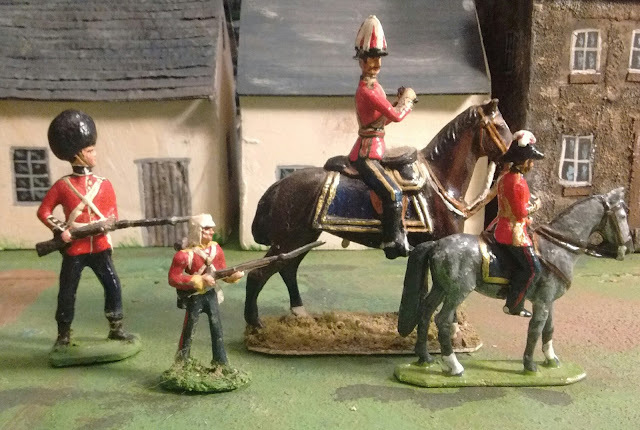 In the near future there are some Mounties and friends waiting as well as the re-awakened desire to add a 12 -16 figure battalion, late 19th Century, Toy Soldier game (thank you Howard). Mostly though I want to do more with my enlarged collection of Elastolin figures. Huzzah in May is fast approaching and while it is likely to be 5 or more years before I make the long haul again, Huzzah is an easy drive and gives me everything I need in a con, esp if my partner in crime can make it. The traffic on Sunday was too heavy, hour after wearing hour, for me to think about future games but on Monday I was cruising north on easy roads and ideas, obstacles, memories and inspirations kept surfacing of their own free will until a thought (no doubt fed by having flipped through the Pavia book and talked about the 2005 Haddington game) popped into my head: "Prince Valiant and the Relief of Haddington 2 - with magic and maybe some monsters." In other words a reworking of our successful 2005 historical game in a different setting using my Elastolin collection. Needs a bit of work but that might just be where I'm headed.